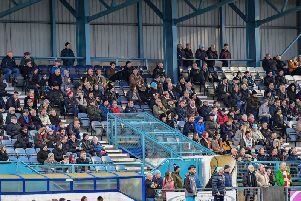 A bumper crowd of just over 400, enjoying free entry to Butlin Road on Saturday, saw perhaps the team's worst game of the season. Valley struggled to create chances in a lacklustre performance and had no answer to the visitors' 65th-minute goal. Rugby Town stay third in the UCL Premier Division on 74 points, with Cogenhoe now fifth. Daventry (87 points) and Deeping (78) are still the top two teams. There are just four games of the season remaining, starting with this Saturday's trip to Holbeach United. Desborough Town are the visitors on Easter Saturday (April 20) before the big derby game at Daventry Town on Easter Monday. Rugby Town finish the season at Harborough Town on April 27.